Solo power LED tail light – the gold standard? The Smart Lunar R1 is a small (AAA) rear LED in the clip-on tradition. It’s the direct descendant of the infamous Smart Superflash 0.5W LED light, but with a better quality of construction (and at greater cost). Currently Chain-Reaction are doing a cracking 35% off. Although more than half of our bikes are now dynamo equipped, I don’t actually own enough sets of dynamo head/tail lamps (!). The Lunar R1 is probably my go-to recommendation for a battery powered rear light, taking all things into consideration. The Smart Lunar R1 has a clip on the rear which allows you to attach it to items of clothing, bags, and so on. The ability to mount on the seat stays means you should be able to find somewhere for the Smart Lunar R1, even if you have a short seatpost or use a seat bag. Don’t worry that the spokes will obscure the light from drivers on an inside lane – in reality they’ll have spent plenty of time being lasered getting into that position. The Smart Lunar R1 has a low mode in addition to steady and flashing – when a light is as excessively bright as this one is, that’s a big advantage in terms of extra runtime for no loss of safety. The R1 may only have half as many power LEDs as the R2 (or RSP Astrum) but it’s still very bright – ten years ago it would have been revolutionary. Because it’s slightly less dazzling, there’s less of an issue of making it so unpleasant for people to drive behind that encourage them to rush an overtake. As a driver, I can vouch that sitting at light behind someone with a mega LED flasher definitely focuses my mind on getting past! It’s important to mount the light completely level, as designers depend on this when working out off-angle visibility and other factors. Do not point it at the ground (especially when you can just use low mode when riding socially)! You can safely ignore anyone who says flashing lights aren’t road legal – this hasn’t been the case for about a decade. Because the Smart Lunar R1 hasn’t passed the relevant tests it isn’t road legal when used on its own (in any mode). 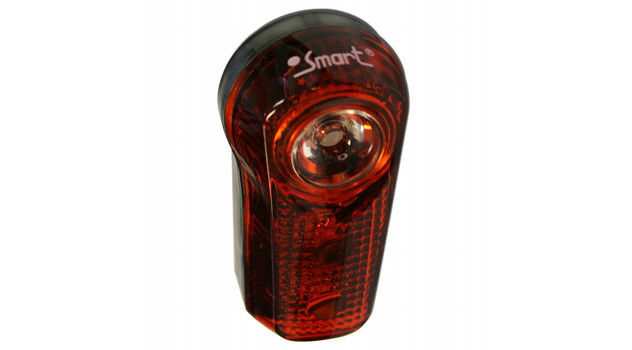 The Smart Lunar R1, like other Smart tail lights, has a small end-on button that isn’t the easiest to operate. It works more like “press in part of the body” than the distinct, super-positive rubber button you’ll find on many Cateye and Raleigh RSP lights. The Smart Lunar R1 runs on two AAA batteries. We get around the stated battery life (100 hours low mode, 30 hours steady). Remember that the temperature at which you use the light and the type of battery used both influence that figure. The Smart Lunar R1 produces quite a lot of light and so is fairly battery-hungry. As with the Lunar R2 light, there are plenty of reports of water ingress online. I have on occasion had one of these lights short circuit (jam in flashing mode) but they’ve always been fine after drying out. I’ve never had one fail to the off mode. Over the years we’ve had a fair number of this type of light (from the original Smart 0.5W Superflash through to the present day). Whatever its weaknesses, at the end of the day it’s useable, effective and economical… one I just keep coming back to! The Smart Lunar R1 0.5W rear LED light is probably my best recommendation for an all-round tail light, taking all factors into consideration. Again, Chain-Reaction are doing a 35% discount at the time of writing.